"1943 Sports Afield Fishing Annual Cover"
This oil on board illustration was painted by Walter Haskell Hinton, and was used on the cover of the Sports Afield Fishing Annual for 1943. Hinton was a master of wildlife and outdoor sporting illustration and many of his scenes contained wildlife and outdoor sporting images, such as fishing or hunting. His attention to detail was unsurpassed, as can be seen in this painting. 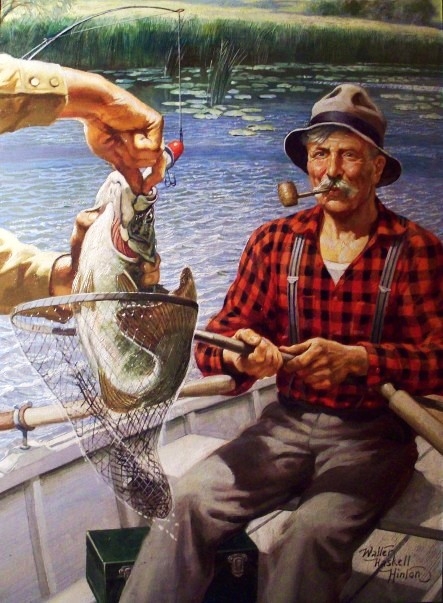 As you scroll over the painting, you will also see the 1943 Sports Afield Fishing Annual cover for which the painting was created. Walter Haskell Hinton was born in 1886 in San Francisco, CA. His family moved to Chicago at the time of the 1893 World's Columbian Exposition. He studied at the Art Institute of Chicago from 1900-1905. Originally, his intention was to become a fine artist, but he had really enjoyed his illustration classes. Hinton had hoped to someday study with Howard Pyle, but due to his father's untimely death in 1905, Hinton could no longer continue his art education studies. In order to provide for his mother and himself, he obtained a job in Chicago as a commercial artist and then worked at an advertising agency in Milwaukee from 1907-1912, also travelling to Mexico and New York City on business. In 1913, Hinton moved to Philadelphia, where he opened a studio, selling freelance advertising illustration. He did work for NW Ayers, The Saturday Evening Post, Cheney Silk Co., Atlas Powder, Indian Motorcycles, Liggett & Myers, and Baldwin Locomotive. He also created a cover for LIFE Magazine in 1912. In 1915, a son, Walter Raymond Hinton was born. Hinton's wife tragically died during childbirth. His 51 year old mother came to live with him and helped raise his son. He never remarried. In 1917, Hinton reported for draft registration, but was considered not elegible for service because his mother and young son were dependent upon him for income. During the 1920's Hinton had found work at a Chicago advertising agency. His list of accounts was growing to include names such as Elgin Watch, Westclox, Inland Steel, Dairy Farmer magazine and Successful Farming magazine. Due to the onset of The Great Depression, he was forced to go back to being a freelance artist. Hinton was extremely prolific. At a time when other artists were struggling, he was doing well, now painting covers for pulp magazines which had become popular during the 1930's. Once he became self-employed, he began painting outdoor, nature, and western themes, all his personal favorites. He did covers for Western Story, Wild West Weekly, Adventure, and Love Story, among others. Hinton was also doing covers for Sports Afield and Outdoor Life magazines. In 1937, Hinton purchased a Swiss chalet style home in Glen Ellyn, Illinois. From 1947 until 1952, he produced several covers and story illustrations for pulp magazines such as Amazing Stories, Fantastic Adventures, and Mammoth Western, produced by the Chicago based Ziff-Davis company. During the 1950's and 1960's, Hinton continued to paint advertising images for John Deere and Washington National Insurance Company. Hinton was known for his wildlife images and landscape scenes, as well as for his historical images. He sold many of his images to companies such as the Brown and Bigelow Calendar Company, which produced calendars and art prints. These images were often later were published in the form of jigsaw puzzles. Although Hinton always worked on a freelance basis with Brown and Bigelow, he had a close relationship with them, and considered himself somewhat of an employee of the company. Walter Haskell Hinton passed away in Glen Ellyn, Illinois in 1980.